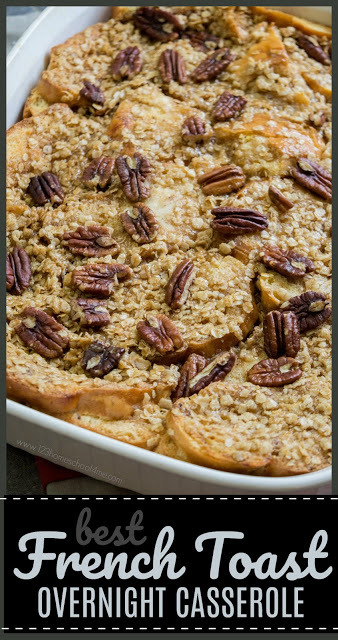 This french toast casserole is my go to for any company, holiday, or special occasion. 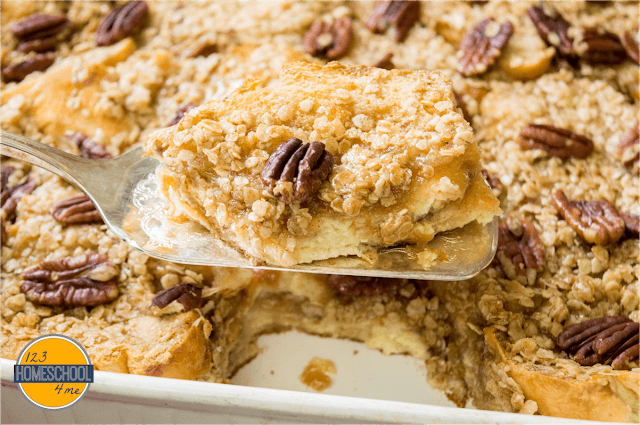 It is not only super easy to throw together ahead of time, but tastes AMAZING with the toffee topping! YUMMY! Are you ready to try your new favorite recipe? 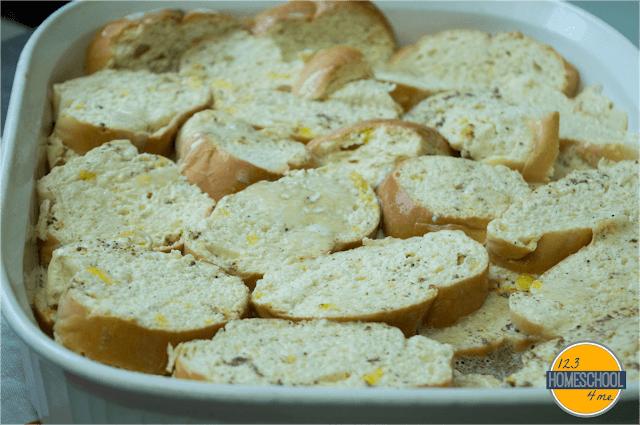 This Overnight French Toast Casserole is perfect for company, holidays, and everyday because it is easy and oh-so-good! 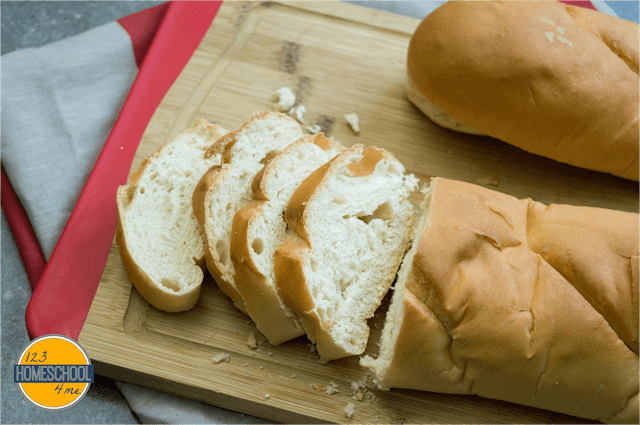 Slice one loaf of French bread into 2- 3″ thick slices. 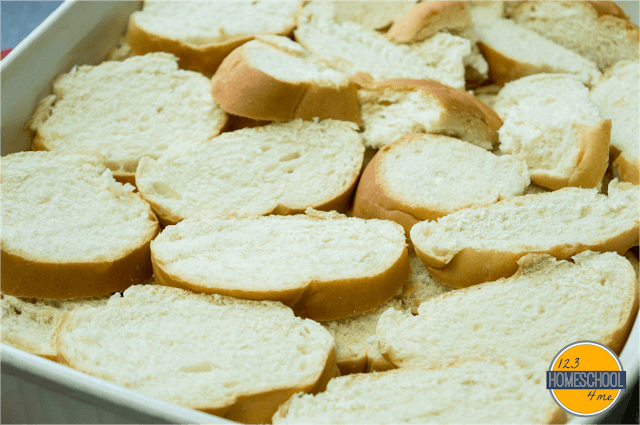 Arrange slices of bread in a 9×13 casserole dish. 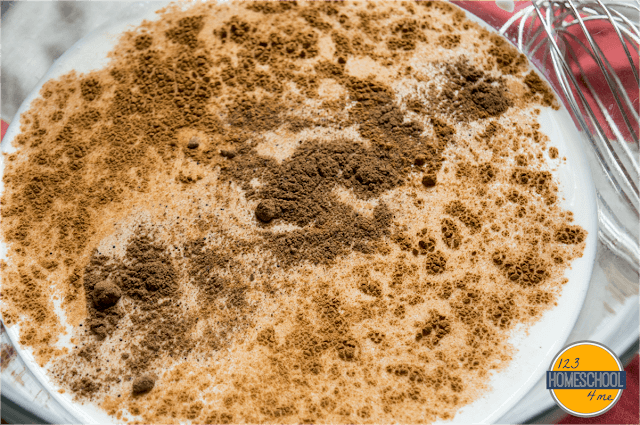 Mix together eggs, half and half, and milk, sugar, vanilla, cinnamon, nutmeg, and salt. Pour egg and milk mixture over the sliced bread. 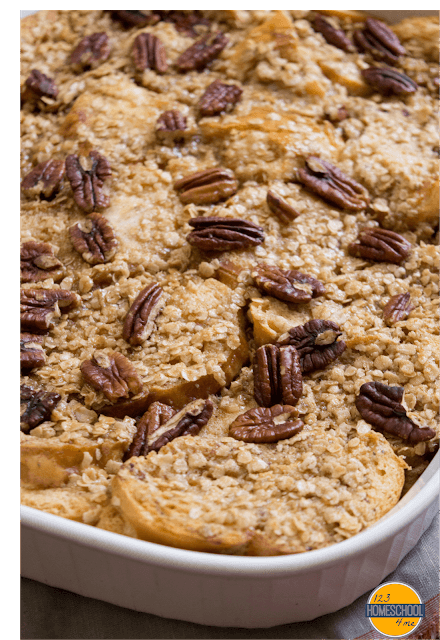 Mix together the praline topping: softened butter, brown sugar, corn syrup, cinnamon, quick oats, and chopped pecans. Spread the mixture over egg soaked bread slices. Cover with foil and store in the refrigerator overnight (or up to 5 days). Cook french toast casserole in 350 F preheated oven for 45 minutes. Serve this fluffy, delicious french toast as your new favorite breakfast. You can serve this with maple syrup, but personally, we find it plenty sweet enough with the decadent praline topping. This will be your (and your companies) favorite breakfast ever! Put slices of bread in 9x13 pan. Mix together eggs, half and half, and milk, sugar, vanilla, cinnaomn, nutmeg, and salt. Pour over bread mixture. 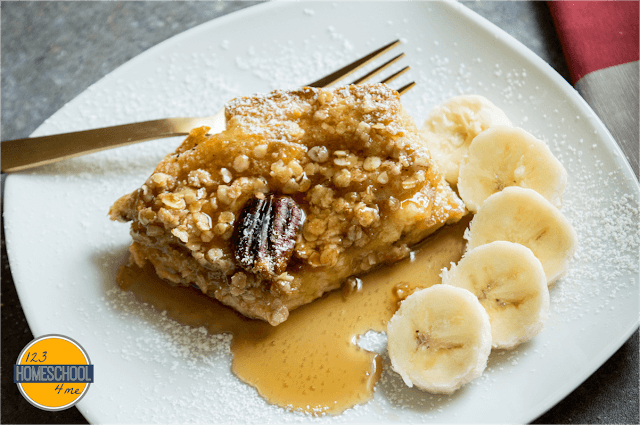 In small bowl mix butter, brown sugar, corn syrup, and cinnamon and oats with fork, Spread over french toast and sprinkle with pecans. Refrigerate overnight (or up to 4 days). Preheat oven to 350 F and return casserole to room temperature. Cook for 45 minutes.